Indian Institute of Technology (IIT), Roorkee has released an advertisement for filling up post of Senior Research Fellow/ Junior Research Fellow/ Research Associate. The engagement is purely project based temporary position for 3 years under Department of Biotechnology, Roorkee from the eligible candidates. A Walk-In-Interview will be conducted on 08 Dec, 2015 at Indian Institute of Technology (IIT), Roorkee. Project : "Process Development for Syntheses of Heterocycle Hydroxamate and Hydrazide Compound using amidase of Bacillus smithii strain"
Screening of candidate will be done on the basis of performance in the walk-in-interview conducted in the Indian Institute of Technology (IIT) Roorkee. Interested candidates are required to appear for a Walk-in-Interview in the office of Head, Department of Biotechnology Engineering on 08-12-2015 at 10.00 AM, IIT Roorkee. Candidate shall bring along with them the plain paper application with their CV and original degree/certificate and experience certificate at the time of interview for verification. • Candidate should bring all important and original educational certificate and marksheet . 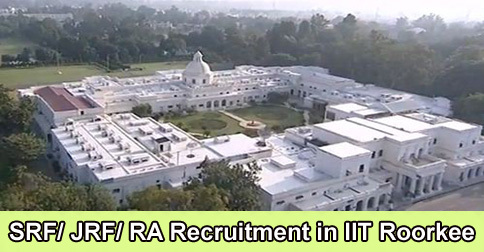 Help us to improve this article/job posting "SRF/ JRF/ RA Recruitment in IIT Roorkee". We would be glad if you can comment below and provide your valuable suggestions and feedback. If this page have any wrong information/list or out of context content, then you can report us as well.